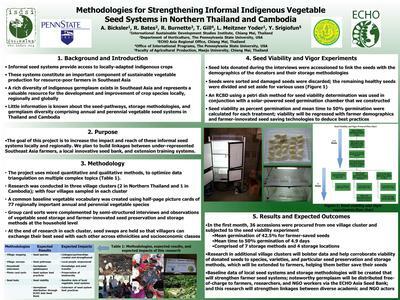 Research posters are effective visual tools that help present information in concise and interpretive ways. Yearly at ECHO's International Agriculture Conference, posters that pertain to tropical agriculture and development are presented by ECHO staff and conference delagates. These include research summaries, crop evaluations, development project summaries and more. If you are interested in submitting a poster for this upcoming conference, please see the poster session and guidelines. Posters may be submitted for review at any time and will be displayed on ECHO Community if approved. While availability of food calories has paralleled human population growth in Rwanda, the supply of highly nutritious foods -such as complete protein, fats, and micronutrients -remain insufficient in the Rwandan diet. Past research has shown the barriers to Rwandans raising chickens to be a lack of technical support, access to capital, and market access. 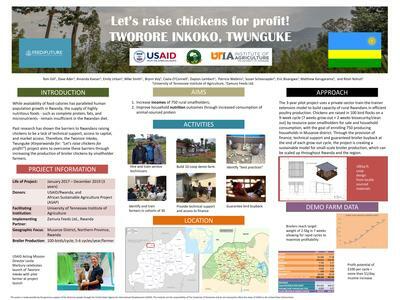 Therefore, the TwororeInkoko, Twunguke(Kinyarwanda for: “Let’s raise chickens for profit!”) project aims to overcome these barriers through increasing the production of broiler chickens by smallholder farmers. The 3-year pilot project uses a private-sector train-the-trainer extension model to build capacity of rural Rwandans in efficient poultry production. Chickens are raised in 100 bird flocks on a 9-week cycle (7 weeks grow-out + 2 weeks biosecurity/clean out) by resource-poor smallholders for sale and household consumption, with the goal of enrolling 750 producing households in Musanzedistrict. Through the provision of finance, technical support and guaranteed broiler buyback at the end of each grow-out cycle, the project is creating a sustainable model for small-scale broiler production, which can be scaled up throughout Rwanda and the region. 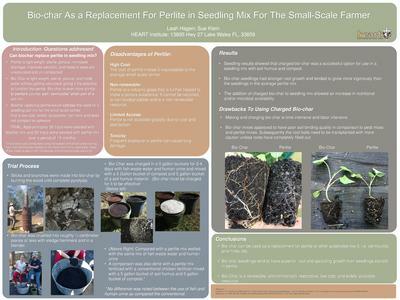 1University of Tennessee Institute of Agriculture, 2Zamura Feeds Ltd.
Can biochar replace perlite in seedling mix? Perlite is light weight, sterile, porous, increases drainage, improves aeration, and helps to keep soil unsaturated and un-compacted. Bio-Char is light-weight, sterile, porous, and holds water without getting saturated, giving it the potential to function like perlite. Bio-char is even more similar to perlite’s counter part “vermiculite” when part of a soil mix. Biochar replacing perlite would address the need for a seedling soil mix for the small scale farmer that is low cost, widely accessible, non-toxic and does not compact or upheave. Moringa is known for its ability to grow in a wide range of soils. We hypothesized, however, that moringa leaf production can be increased by applying fertility inputs at the base of the trees. Do moringa trees benefit from fertility inputs? If so, how many grams of nitrogen (from NPK fertilizer) per tree are needed to maximize moringa leaf yield in a sandy soil? Does it make any difference, in terms of moringa yield, if NPK fertilizer is combined with compost? Moringa trees responded favorably to added fertility. 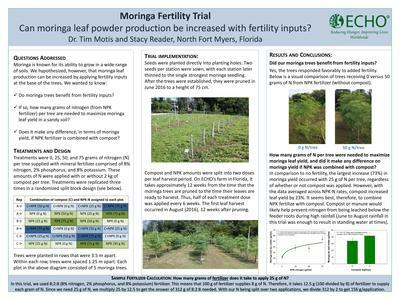 In comparison to no fertility, the largest increase (73%) in moringa yield occurred with 25 g of N per tree, regardless of whether or not compost was applied. However, with the data averaged across NPK-N rates, compost increased leaf yield by 23%. It seems best, therefore, to combine NPK fertilize with compost.